« The Unbearable Lightness of Mobile Voice. 1000 Days & a bit … As of January 2015 a Facebook share was around Double the price of their initial public offering (IPO) back in May 2012. That increase in share price & value correspond to an investor belief (conscious or otherwise) that Facebook’s can grab around 40% of the online spend in the (near) Future versus a mediocre 20+% back in 2012. If you had bought Facebook shares on September 4th 2012 and sold them again December 22nd 2014 (yes just before Christmas) you would have earned 5 times your original investment! Back in 2012, some month after Facebook’s (FB) IPO, I wrote a Blog Facebook Values … Has the little boy spoken? on the FB value and how to get a feel whether the share price was Naked (“The Ugly”), Half Dressed (“The Bad”) or Nicely Dressed (“The Good”). I asked whether it was a good time to have confidence and invest in Facebook … My answer (at the time) was that the share price of about 20 US$ (August 2012 timeframe) appeared too low compared with the potential for capturing Online Advertisement Spending Market Share, that furthermore was poised to increase substantially going forward as funds were being redirected from traditional advertisement spend to digital / online media. The primary source of revenue for Facebook (then & now) is from Online Advertisement Spend. Thus, I looked at what long-term share (chosen arbitrarily to be 5 years) of the Online Ad Market should Facebook have in order to justify its value and share price. Very simply I ramped up the revenue share from its current value to a target share that would correspond to Facebook’s Market Capitalization or Share Price. Atlas Ad Server Platform (acquisition Feb 2013 & re-vamped Sep 2014). Autoplay Video Ads (Mar 2014). (note list is not intended to be exhaustive). All of the above (and much more) serves to make sure that “People use Facebook to stay connected with friends and family, to discover what’s going on in the world, and to share and express what matters to them”. (i.e., Facebook’s vision statement) … and (I assume) to make maximum profit out of the Facebook “addiction” by providing a very efficient advertisement platform enabled by the gazillion of personal data/information & impressions we all continuously volunteer by using Facebook. However, while the technologies (e.g., algorithms & communications software utilities) behind are very exiting it all serves one purpose … deliver the most efficient ad to the user and make as much money out of that customer touch point. I believe that the potential and value of Whatsapp is huge and in message volume already exceeds the number daily SMS transactions globally. This still largely remains un-explored by Facebook. The question will be whether FB will primarily use Whatsapp as another Ad delivery vehicle or also as a mean to generate communications revenues in both the messaging and the voice consumer segments. The conclusion back in August 2012, was that the share price of Facebook, based on its equivalent long-term share of the the Online Ad Market Spend, appeared low and one should expect the price (and value) to increase. 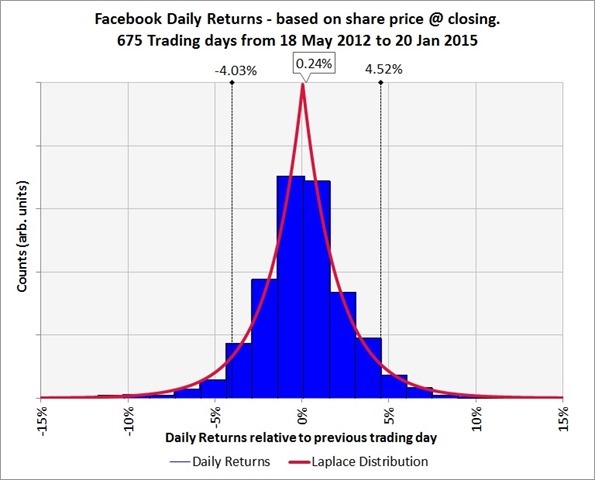 Above figure: Analysis presented in my 2012 “Facebook – time to invest?”. Note that the the share price dynamics are illustrated relative to the IPO price of 38 US$ or more accurately the stock price at closing on 18th of May 2012. 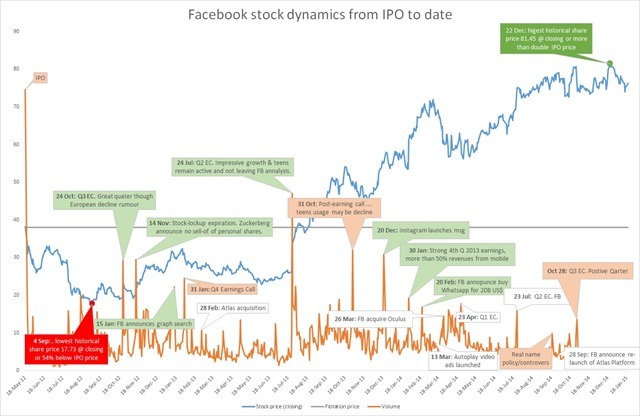 So what has happened in the almost 1000 days since the Facebook IPO? Well after the share price dropped to 17.73 (at closing) on September 4th (2012), which roughly halved the Market Cap of Facebook, the FB Journey has been one of growth. The cynic might of course point out that so has the rest of the market. However, while for example Nasdaq100 is ca. 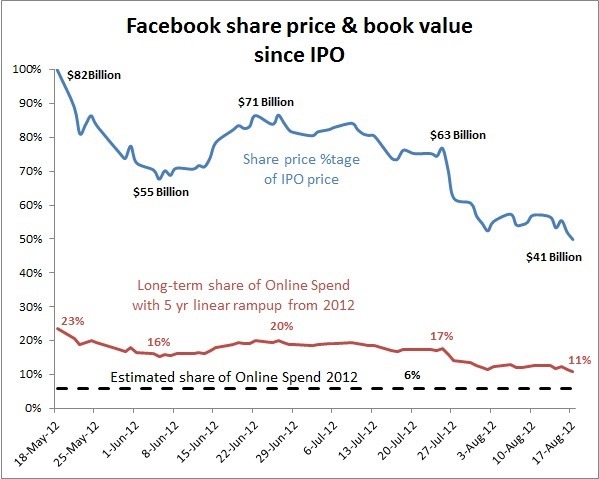 68% higher (as of January 20th 2015) compared to the 18-May 2012, Facebook is almost double its IPO value (over the same period). If you take the lowest point (4 Sep 2012) and the highest point (22 Dec 2014) you have a 4.6 times ratio between high & low points. So if you did the right thing and bought the lowest and sold at the highest … well I told you so (joking!) … Congratulation would be called for! Above figure: illustrates Facebook stock price development since the IPO until end of January 2015 with commentary to the peaks and the dips.The Red Dot on September 4th 2012 represents the lowest historical share price (i.e., 17.71 @ closing) and the Green Dot the highest historical share price (i.e., 81.45 @ closing). Taking the stock price dynamics as shown above, how would the previous analysis come out looking at what Online Ad Revenue Share could justify (approximately) the share price development over the period. Above Figure: illustrates the share price dynamics relative to the IPO price, i.e., 100% level (at closing 18 May 2012). 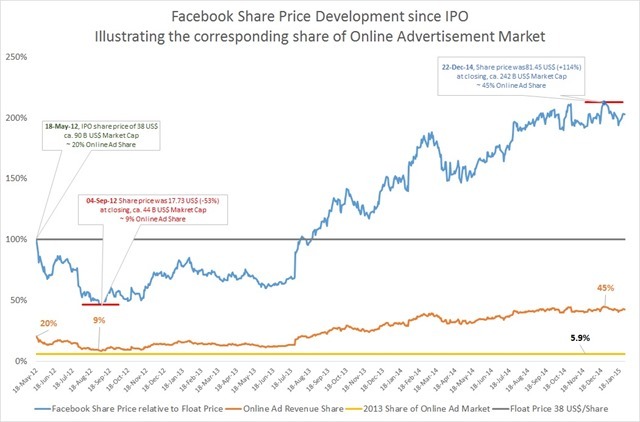 Further a relative simple valuation model based on Facebook’s long-term (i.e., 5+ years) online advertisement market share is used to derive the Online Ad Spend share that a given FB share price corresponds to. The methodology has been described in detail in “A walk on the Wild Side”. Current stock price range is fairly consistent with a 40+% long-term (i.e., 5 year linear ramp up from 2013 share and then keeping the share at the level going forward) share of the Online Advertisement Market. 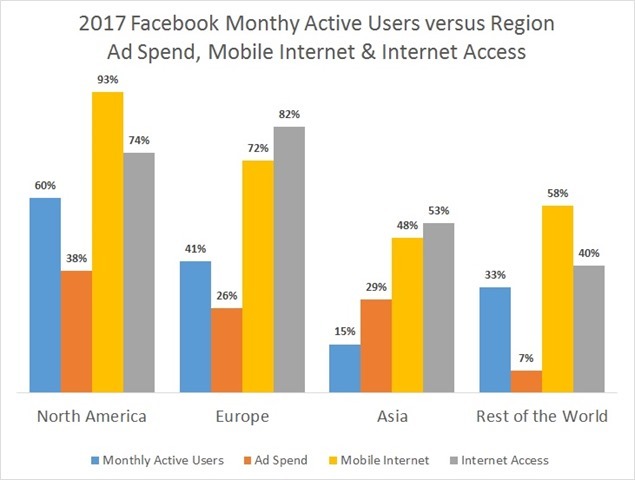 I would expect Facebook to hit at least 10% for 2014 (based on eMarketer data of the total online advertisement market). Will Facebook be able to grow to 40+% share of the Online Ad Spending? Though it would imply that (a) other social media players also relying on the Online Ad Market are going to lose their livelihood, some (b) business plans might look somewhat more sombre for others and (c) Facebook needs to take Google Head-On. It will be very exiting to follow Facebook’s Q4 2014 and Full Year 2014 Earning Call on 28th January 2015 at 2 PM Pacific Time (i.e., 11 PM CET & 1 AM AST 29 January). Facebook beating Q4 earnings expectations and came out at 3.851B US$ coming out at 3.84B US$ (Low) to 4.16B (US$) (high). MAU 1,393 1,386 Million and Mobile MAU of 1,189 1,182 Million (both lower limit estimates). Share price at closing was slightly higher than previous trading day ending at 76.24 US$ per share (+0.6%) will drop during the day of the earning call to around 71 – 72 US$ per share. Given the already high value of the stock, I do not expect much gain over the days after the earning call. Likely to recover to the level 5 – 10 days before the Q4/Full 2014 Earning Call. … and I might be completely mistaken (and will be crying all the way to the bank)… but at least we will know within the next hours & days to come! … So I ended up being fairly close to MAU (0.5% lower), Mobile MAU (0.6% lower) and earnings expectations (0.3% from my lower bound). However, predicting the stock movement … yeah … not so good. Still next couple of days will be interesting to follow. Dave Wehner, Facebook Chief Financial Officer, was where careful in managing expectations for Facebook Topline in 2015. Concerns about exchange rate effects on the Topline could result in a 5% lower revenue than it would have been with 2014 exchange rates. Basically the revenue growth in US$ would reduce somewhat due to exchange rate effects. This is likely to have some negative impact on Facebook profitability and their margin as their fundamental cost base is in US$. See also my Social Media Valuation Blog “A walk on the Wild Side”. 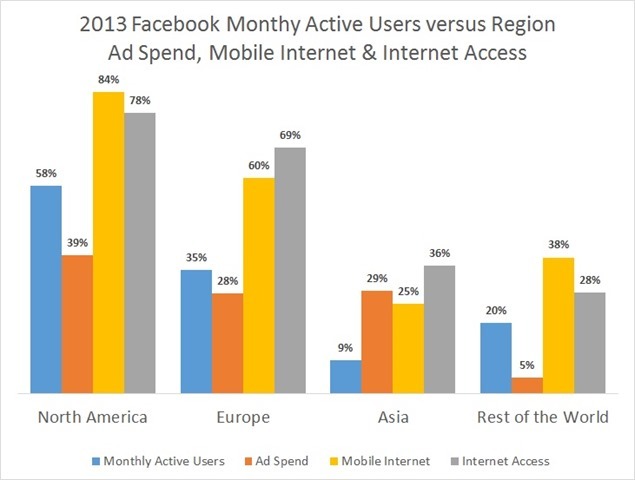 2013 FB capture 6% of total online ad spend. 5 yr linear ramp-up from 2014 9.6% (assessed) to X%, and then maintained at that level. Other revenues 15% in 2014, linearly reduced to 10% after 5 yrs and then maintained. It should be noted that the above analysis is in all likelihood oversimplifying. However it is not terrible difficult to add complexity. Though given the inherent uncertainties involved in predicting the future, the approach presented is good enough to get an idea about a given investments (or stock purchase) attractiveness. For the financial history buffs, the Nasdaq100 is ca. 5% from the level of the dot.com foreshock (or pre-crash) of March-2000 and has surpassed the big crash of July-2000. 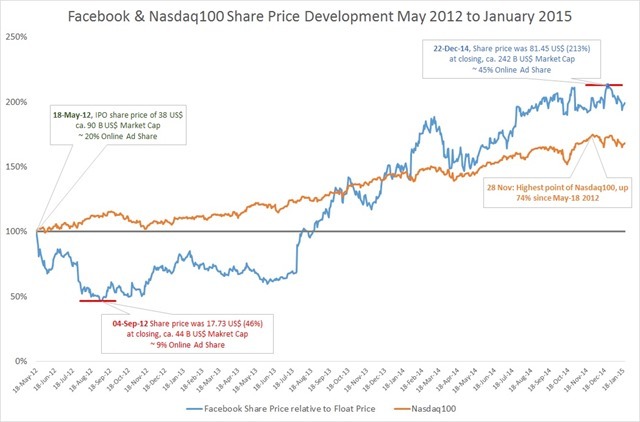 Figure above: shows the share price development from May 18 2012 (IPO date of FB) to 20 January 2015 of Facebook and Nasdaq100 composite. While Facebook largely under-performed in 2012 and well into 2013, its recovery from mid-2013 until January 2015 has been spectacular. Figure above: shows the histogram of daily returns relative to the previous trading day using the closing share price. It should be noted that the return distribution is consistent with a (slightly asymmetric) Laplace Distribution rather than normal. In other words the return distribution is more peaked and concentrated around the center-mass than a (log)normal distributed return function would be. For more details on Laplace distribution and its finance applications, such as analysis of share price returns among other things, see The Laplace Distribution and Financial Returns (Business Forecasting Blog), T.J. Kozubowsk et al “Asymmetric Laplace laws and Modeling Financial Data”, H. Follmer et al.,“Probabilistic aspects of finance”, W.J. Reed “The Normal-Laplace Distribution and Its Relatives” and K.K.J. Kanichukatt “Generalized Brownian – Laplace Processes and Financial Modelling”. 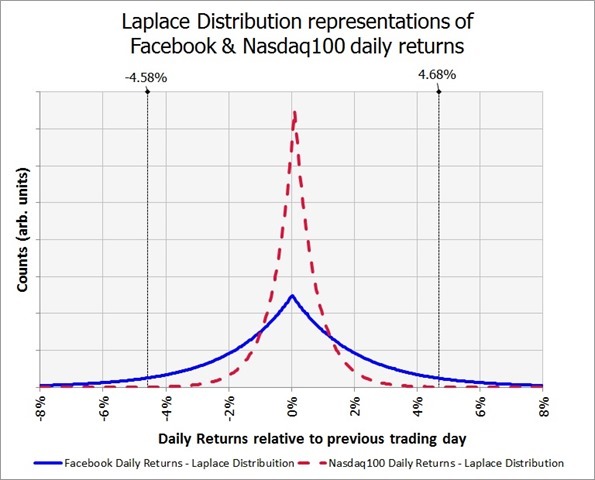 Figure above: illustrates Laplace distribution representations of the daily returns of Facebook and Nasdaq100 over the period from 18 May 2012 to 20 January 2015. Note the slight right shift in centre point from the 0%. For a more detailed analysis of the Nasdaq100 and application of the Laplace distribution see the Business Forecasting Blog “The Nasdaq100 Daily Returns and Laplace Distributed Errors”. 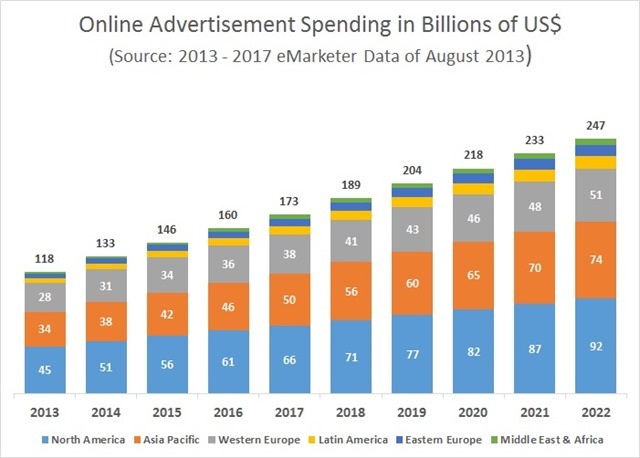 Figure above: Online Advertisement Spending forecast from eMarketer (August 2013) representing the period 2013 to 2017. From 2018 and to 2022 Forecasts have been extrapolated based on 1st and 2nd derivative of the previous period growth. The resulting trend have been checked against other available projections. 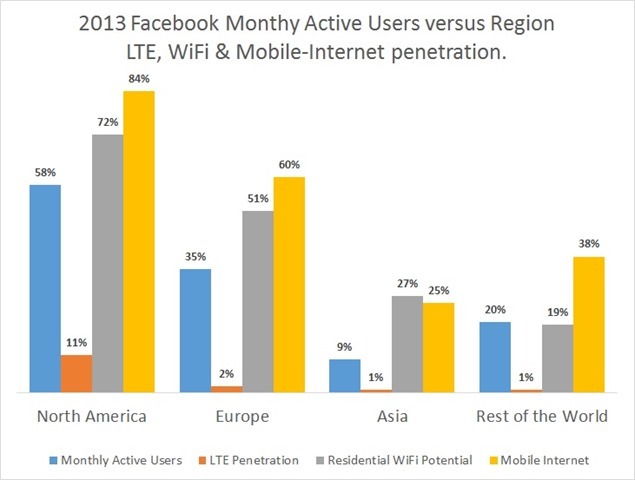 Figure above: illustrates for 2013 Facebook Monthly Active Users (MAU) in terms of share of population versus Region (source: Facebook Annual Report 2013), Region’s share of Ad Spend (source: eMarketer), Mobile Internet Penetration (i.e., CDMA2000, UMTS, HSPA, LTE, Mobile WiMax, source: Pyramid Research), and (fixed) internet penetration (i.e., the percentage of population having access to internet). 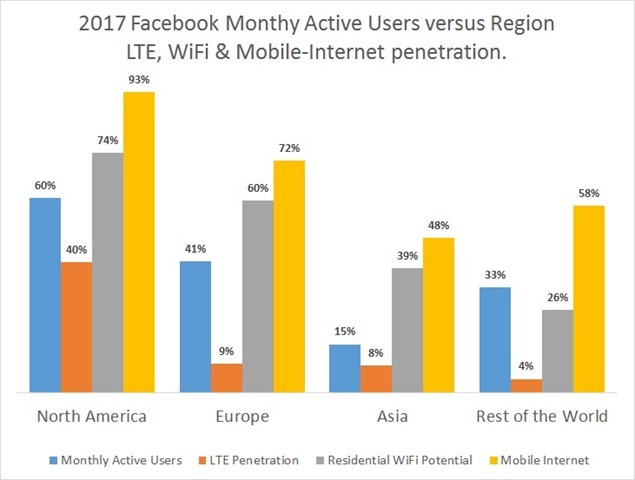 Figure above: illustrates for 2017 Facebook Monthly Active Users (MAU) in terms of share of population versus Region (Source: Authors Facebook Model), Region’s share of Ad Spend (Source: eMarketer), Mobile Internet Penetration (i.e., CDMA2000, UMTS, HSPA, LTE, Mobile WiMax, Source: Pyramid Research), and (fixed) internet penetration (i.e., the percentage of population having access to internet). Figure above: illustrates for 2013 Facebook Monthly Active Users (MAU) in terms of share of population versus Region (Source: Facebook Annual Report 2013), LTE penetration (Source: Pyramid Research), WiFi residential potential estimated from the broadband household penetration (Source: Pyramid Research), and Mobile Internet Penetration (i.e., CDMA2000, UMTS, HSPA, LTE, Mobile WiMax, Source: Pyramid Research). For Facebook’s Autoplay Video feature it is important for the user to either have WiFi access or for a decent cellular performance LTE. Figure above: illustrates for 2017 Facebook Monthly Active Users (MAU) in terms of share of population versus Region (Source:Source: Authors Facebook Model), LTE penetration (Source: Pyramid Research), WiFi residential potential estimated from the broadband household penetration (Source: Pyramid Research), and Mobile Internet Penetration (i.e., CDMA2000, UMTS, HSPA, LTE, Mobile WiMax, Source: Pyramid Research). For Facebook’s Autoplay Video feature it is important for the user to either have WiFi access or for a decent cellular performance LTE. This entry was posted on January 27, 2015, 11:00 pm and is filed under Business Modeling, Economics, Finance, Pricing, Social Media, Strategy. You can follow any responses to this entry through RSS 2.0. You can leave a response, or trackback from your own site.